A blog about my work, everything X10 and more... Join in! Ready your thumbs: The iconRemote is getting closer! iPod DJ on an iParty! Have you heard of lock bumping? Have you been doing your thumb stretches? The much anticipated release of the iconRemote Universal Remote Control is just around the corner! This is more than your average universal remote. I already told you about all of the great features (custom favorite channel buttons, HIS and HERS favorites, easy-to-use macros, a bright and colorful LCD display, and more - see below), and now I have something new for you. We have just put up a new webpage to generate customer interest in this amazing new remote. You can find everything you need to know about the iconRemote here at www.X10iconRemote.com. Make sure to sign up for the email updates so you don’t miss out when the iconRemote goes on sale. These things are going to fly off the shelves! Tell your friends. Why wrestle with a bunch of remotes when this handy little gadget can replace them all and do so much more! To receive an alert when the iconRemote is released enter your email address below, and I'll keep you updated! Want to be the FIRST TO KNOW when the iconRemote is released? Sign up today and we will send you a reminder the instant it's available! I work hard all week, but when I have the free time, sometimes I want nothing more than to sit down in front of my television, and tune in and tune out for a couple of hours at a time. Now, I don’t consider myself a couch potato by any means, but I am, admittedly, a huge technology geek, and if you could only see my set-up, I’m sure you’d understand how I could get such a huge kick out of planting myself in front of the TV for hours on end. It’s never really been my style to brag, but to describe my home entertainment system as “extensive” would be a gross understatement. I’ve got a big, plasma screen television, a six-speaker stereo system, digital cable, a DVD player and a VCR. I’ve even been thinking about picking up one of those new HD DVD Players. The only problem is that every time I add another component to my entertainment system, I have to add another remote to the growing pile on my coffee table. Right now, I have so many different remote controls scattered across table tops and hidden between couch cushions, that they’re becoming harder and harder to keep track of. When friends come over, and they want to watch a little bit of television, or a movie, they can never seem to figure out which remote turns on the TV and which one operates the DVD player—they’ve been on my back to pick up a universal remote for months now! But I wasn’t sure if there was a single remote control out there that could effectively replace the ones I already have, so I had to make sure to do my homework. Working at X10 pays off in many ways, but today I was espcially happy to hear about a solution for remote control(s) problem! And set-up is easy too. Unlike the Harmony Remote from Logitech, which must be connected to a computer before you can get started, the iconRemote is ready to go, right out of the box, no additional equipment needed! All I had to do was turn it on, and the On-Screen Wizard guided me through the entire set-up process. And there are no remote control code books to fumble through either, because the iconRemote has the world’s most extensive code library stored in its internal memory! And in the unlikely event that I need a code that isn’t contained in the iconRemote’s internal memory, it’s not a problem, because this handy little piece of technology is capable of learning commands directly from another remote! And there’s so much more: The iconRemote features ten programmable buttons (versus the Harmony’s four) while features such as Punchthrough and Quickpower make it easy for me to activate my entire entertainment system with the push of a single button! And it just keeps on getting better! This amazing remote features large, easy to read buttons, while a Smart Macro system allows me to execute complicated tasks with a single command. For example, I can turn on my TV, my DVD Player and my stereo simultaneously, and get my favorite movie started (with surround sound), all with the push of a single button! And the best part is, I can finally get rid of all my other remotes! So when is this great new toy available? SOON, VERY SOON! If you’re anything like me, you can’t live without your iPod. Mine has become an indispensable part of my daily routine. Just ask anyone who knows me, and they’ll tell you that I’m rarely ever seen without those trademark little white Earbuds planted firmly in my ears. Whether I’m at home or away, I gotta have my music. Earbuds are great when I’m on the go, but when I’m relaxing at home and I’ve got those headphones up like I’m listening close, they pretty much cut me off from the rest of the world. And more often than not, they get in the way. Besides, sometimes I enjoy listening to my music the way it was meant to be listened to, and most of the time, headphones don’t cut it. They just don’t have the kind of power you get from a real pair of speakers. And when you listen to headphones as much as I do, sometimes you just have to get away from them. So I’m up late one night, just surfing the web, and that’s when I found out about the iParty from X10. You can do tons of cool stuff with this thing. All you have to do is slide your iPod nano or iPod Mini into the iParty, and connect the included receiver to your stereo, and you’re good to go! That’s all there is to it, I swear! 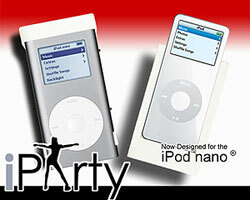 Once I had my iParty all set up, I was able to listen to all the music on my iPod over my stereo speakers. So now I get a fuller, richer sound—something I miss out on with headphones. The iPod and the iParty when combined is about the size of a deck of cards, so I can still carry my music around with me. And that’s cool because when I team my iPod up with my iParty, I can use the iPod itself as a wireless remote. So I can change tracks, fine-tune my volume settings, even create and sift through playlists without getting off the couch. But the coolest thing about the iParty, by far, is the fact that it makes listening to my iPod a completely social experience! A couple of weekends ago, I decided to have a little get together. Being the raging geek that I am, I was kind of excited to show off my iParty. And it worked like a charm. I played DJ the whole night, using my iPod as a remote. And because I was able to walk around and mingle with the crowd, I didn’t miss a thing! Have you heard of lock bumping? I hadn’t until one of the X10 community members emailed me an eye-opening news article (Thanks, Lynn!). Apparently lock bumping is becoming more and more popular among burglars and intruders. Well, from what I understand, a “bump key” is made from modifying a key blank (the one’s hardware stores use to make copies of your house keys). A thief files it down a certain way, and then he is ready to break into your home. By slightly turning the key a certain way and tapping the end of it a few times with a mallet, screwdriver, or even his hand, the thief “bumps” your lock and easily opens your door. It only takes a few seconds, and it doesn’t even look suspicious. To make matters worse, there are instructions on how to bump locks all over the internet, and apparently, this technique works on 90% of locks. One story I read even said it is so easy to do that a child can learn the technique in only a few minutes. Pretty scary stuff. So what can you do to protect yourself? -Start a neighborhood watch program in your neighborhood. Getting to know your neighbors and letting them know when you will be out of town is a great way to help keep an eye out for suspicious behavior. -Make sure that the perimeter of your house is well lit. We have the perfect solution at X10.com. Our Motion-Activated Floodlights are motion activated and weather resistant. And, right now they are at the low price of only $69.99! Click here for more information. A barking dog will make that burglar think twice before he tries to get into your home. My german sheppard makes sure of it! 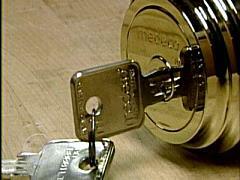 -Replace your locks with “bump proof” locks. They are available at many hardware stores starting at $140 for a dead bolt. -Buy a home security system. This is a great way to alert yourself and your neighbors in the event of a break-in. We have an extensive line of security systems at X10.com. Our wireless Protector Plus Security System offers complete protection including door and window sensors, siren and flashing light alarms, an infrared motion detector, easy, do-it-yourself installation, and it will even call your cell phone in the event of an emergency. All for only $99.99! Click here for more information on X10 Security Systems. Video senders are nothing new. In fact, they’ve been around for sometime now, although I guess I wouldn’t be too surprised if you’d never heard of them before at all. You see, the cable companies do their absolute best to keep them a secret. When I had my digital cable service activated, the cable company provided me with a single cable box. That’s right, ONE box. There are TWO televisions in my home. You do the math. Doesn’t quite add up, does it? The single box works great with the TV in my living room, but does absolutely nothing for the TV in my bedroom. I was told that if I wanted to use my digital cable with multiple TVs, I would have to pay for another cable box. I wanted to find a way to watch my digital cable on either TV in my home, but the last thing I wanted was to spend money on another bulky piece of equipment that would take up space and spread its wires through my home like some sort of wild, overgrown vine. Fortunately, X10 was able to provide me with the perfect solution to my problem: The new and improved VK82A Video Sender (What can I say? I just happen know a couple of the good folks who work at X10…). So maybe you’ve heard of a video sender before. If you’re already familiar with them, then get ready for something completely different, because this video sender is new and improved! The first thing I noticed was its compact size. I mean, this thing is small— about the size of computer mouse, so I can hide it anywhere I want to. Not that I need to hide it at all: This video sender doesn’t sacrifice form for function. It sports a sleek and stylish design that looks high-tech and matches well with my entertainment system—that’s something my wife really appreciates. But don’t be fooled by this video sender’s compact size—it’s as powerful as ever! This amazing new video sender even comes with a built-in remote sender which allows me to control the action with my remote control no matter which TV I’m watching! And, the whole set-up is legal, unlike all of those other “black box” scams you’ve probably heard about. And it doesn’t end with digital cable. If you have more than one TV in your home, but can’t afford to equip them all with expensive electronic equipment such as DVD players, then the VK82A Video Sender is the perfect solution for you. It works with RCA or coaxial cables, making it compatible with most audio/visual devices. In fact, with the right connection, you can even use it with your PC! Watch movies you’ve downloaded to your hard drive right on your TV screen! So if you’re looking for an effective and affordable way to get a signal from one TV to another, check out the VK82A Video Sender—just don’t tell your cable company about it! With the latest beta of Skype for the Macintosh, released on Wednesday, Skype Technologies SA hopes to help bridge the barrier between Macs and PCs for video calling. Users of Skype for Mac 2.0 will be able to make video calls to both Mac and PC Skype users. Other options exist for such cross-platform video calling but not from the most popular instant messaging clients. The last Skype release for Macs, Skype for Mac 1.5, does not support video calling. Mac users with the free Skype software can view the video call within the Skype window or on the full computer screen. Users can also see how they appear to the person they are calling in a small window on the screen. Other options from lesser-known providers are also available. SightSpeed offers free software that supports video conferencing between Mac and PC users. Mac users interested in the latest version of Skype must be running Mac OS X v10.3.9 Panther or newer and have a G4, G5 or Intel processor. It used to be that when you shopped to purchase a webcam there wasn’t much to consider besides price. Webcams typically didn’t have too many features. Maybe it was because they were never taken too seriously and considered more of a toy for techies or kids. But that has all changed. Instant message applications like Skype and MSN Instant Messenger to name a couple, now provide video calling FREE! As a result, webcams are enjoying a whole new audience- an audience that isn’t satisfied with the webcams currently on the market. Here at X10, we communicate with our customers and take notes! We’ve heard from them that they want a camera that provides more than just a grainy image that only works (barely) with perfect lighting and static subjects. That’s why our developers have worked hard to design a well built multi-functional, high quality camera. We don’t even call it a webcam because it’s actually a Video Calling System. It’s loaded with features such as whisper quiet pan and tilt, providing a wall to wall, floor to ceiling complete view that you can actually control remotely with the included remote control. It also has a powerful 44X zoom, so you can get up close and personal, just like you would in real life! Our customers told us that they often make video calls during the evening and don’t want to have all the lights blazing in the house. So our designers developed what they call Starlight Mode which requires only .02 lux (1 lux is equivalent to moonlight) to capture a clear image- so you can use our Video Calling System even in candlelight! If your feed reader is a program on your computer, click here.